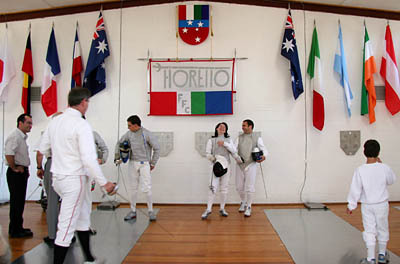 Fioretto Fencing Club was founded in 1982 by Maestro Joe D'Onofrio. It started as a handful of new fencers, Maestro and a school hall. The club has come a long way since those humble beginnings. In 1996 the club achieved its first landmark win in securing a rundown scout hall in Clayton as a permanent training venue. This gave rise to a prosperous period of growth. Membership expanded and the club invested huge amounts of energy and resources into developing the venue to provide members the best possible training environment. In 2002 Fioretto was the first fencing club in the state to send a coach overseas to become qualified to train wheelchair fencers. Shortly after it began the only wheelchair training program in Victoria. At the same time, Fioretto had been developing a strong sabre squad under coach Eddie Marmur. Victorian sabre fencing was at a low point and Fioretto fencers soon accounted for more than 50% of the competition and dominated the top positions. Unfortunately, this was not to last. Late in 2003 the local council was forced to make a tough decision regarding the hall. Despite renovations to the interior of the hall, continuing structural deterioration to the building obliged the council to condemn it as unsafe. Suddenly the club had to find itself a new home. Fortunately, the local Uniting church had a suitable hall available, but the cost of hiring the venue forced the club to reduce its training times. Over the next two years membership wilted by 40%. But Maestro Joe was not beaten. He worked relentlessly in the background to find and secure a new venue. The result was spectacular, with the acquisition at the end of 2006 of the new Fioretto Hall in East Oakleigh. 32 fencers moved into the new hall at the end of 2006 with the club running 3 sessions a week. Since then club membership has grown rapidly beyond the capacity of our venue. With over 100 members and beginners each year the club now runs 10 sessions a week, plus Sunday competitions and holiday workshops. With 3 dedicated junior training sessions, Fioretto has led the way in Victoria in Junior development and has had great results at State and National levels in both foil and epee. Most important though is participation, which is so high in our junior groups that we are continually forced to restrict recruitment in accordance with the physical limits of our venue's capacity.